Satellites of all sizes are opening up a world of opportunity in Africa – not only in terms of scientific research but for the man in the street too. After winter this year, residents of Cape Town had a reason to be grateful. Following a devastating drought, the region had been facing the dreaded ‘Day Zero’ – when municipal water would have been cut off, forcing people to queue at designated points to collect just 25 litres a day per person. Fortunately, the rains came in mid-2018 and dam levels recovered to more than 75% collectively as summer began. Of the major dams that service the Cape Town area, the biggest is Theewaterskloof, near Villiersdorp. Its capacity is estimated at around 480 million m³ but following the drought it had dropped to about 25% capacity. By mid-October it had recovered to nearly 60% full. Still not anywhere to make the authorities really happy but enough to stop them having nightmares. While the dam gradually filled, a scientist at the South African Environmental Observation Network (SAEON), Glenn Moncrieff, used a network of tiny satellites to capture time-lapse images of the dam swelling as water flowed into it, Business Insider reported. The satellites, made by a US company called Planet Labs, enabled him to create a series of animations showing Theewaterskloof’s water levels between 2015 and this year. Planet Labs, based in San Francisco, was formed by three former NASA scientists. It builds tiny (they have been described as bread-loaf sized) satellites that are carried into space in mass launches. Unlike conventional satellites, they orbit very close to Earth and have limited lifespans (they are also cheap to build). Formed in 2010, Planet Labs launched its first Dove satellite in 2013 and, in 2017, shot 88 into orbit aboard the Indian Space Research Organisation’s PSLV rocket. A few months later, a Russian Soyuz carried another 48. It recently raised around US$180 million in funding, including from Google. Planet Lab plans to upgrade software to its satellites in a process that would be familiar to users of smartphones. ‘From the beginning, we had the notion that we didn’t have to do space the same way it had been done before,’ says Mike Safyan, Planet Lab’s vice-president of launch and global ground station networks, in an interview with the Los Angeles Times. Small satellites, sometimes referred to as nano satellites, are revolutionising the imaging of Earth as well as communications, but the ‘big boys’ (traditional larger satellites) have very important benefits in terms of connectivity for Africa. Big satellites can send back images with finer details as they have larger cameras. They also have much longer lifespans and a lot more onboard power. There have been several important developments recently regarding new satellite deployment. Intelsat, the New York Stock Exchange-listed company, for example, and Azercosmos, the national satellite operator of Azerbaijan, in September launched the Intelsat 38 and Azerspace-2 satellites aboard an Ariane 5 launch vehicle from the Guiana Space Centre in Kourou, French Guiana. According to the company, Intelsat 38 is a Ku-band satellite to be placed at the 45ºE orbital location to host direct-to-home [DTH] platforms for Central and Eastern Europe as well as the Asia-Pacific region, and to provide connectivity for corporate networks and government applications in Africa. ‘Today’s successful launch is a great example of the power and value derived from collaborating with other satellite operators,’ said Stephen Spengler, CEO of Intelsat, at the launch. 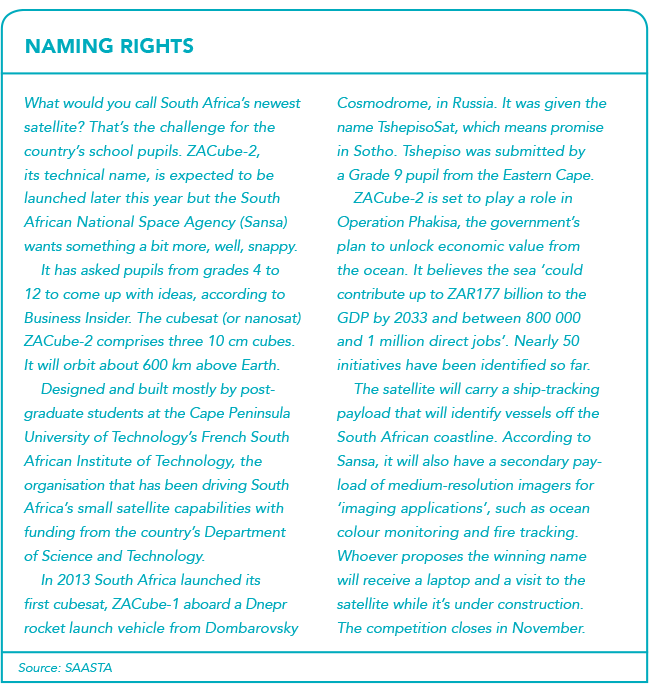 Azerspace-2 will also cover parts of the African continent. They are expected to enter service in the first quarter of next year. Intelsat certainly has been busy. In October it announced that it had invested in Africa Mobile Networks (AMN). ‘The purpose of the investment is to accelerate the deployment of mobile connectivity to unserved communities across multiple countries in sub-Saharan Africa,’ according to the company. 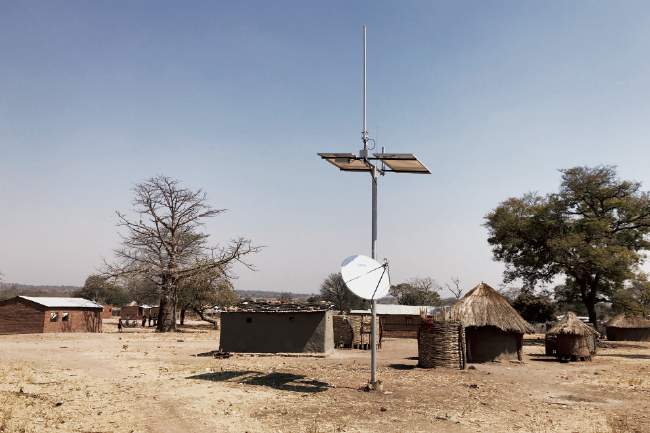 ‘Given the economic and geographic complexities of expanding mobile connectivity to the ultra-rural areas of Africa, many mobile network operators [MNOs] face barriers when trying to deploy their networks to these areas. AMN provides MNOs with a network-as-a-service [NaaS] solution in which AMN will fund, build and operate the ultra-rural network for the operators. AMN provides a ‘small cell solution’ powered by solar panels, which can be installed in only a few hours. ‘Once installed, the sites will connect over the Intelsat fleet to the core of the mobile network operator and deliver 2G mobile services, such as GSM voice, SMS and GPRS/EDGE packet data, with the ability to upgrade the base stations to 3G and 4G as data demands allow,’ according to Intelsat. The company also announced an agreement with Q-KON, a South African telecoms engineering company, to introduce high-speed broadband services powered by the IntelsatOne Flex for Enterprise platform. ‘Combining a cloud-based management platform with Intelsat’s global satellite and terrestrial networks, the IntelsatOne Flex platform will enable Q-KON to rapidly deploy high-quality broadband that enables new services and applications for smaller businesses throughout Botswana, Mozambique, Namibia, South Africa, Zimbabwe and Zambia,’ states Intelsat. ‘Broadband connectivity is spreading rapidly but it is not spreading equally, as the economics have kept it out of reach in many parts of Africa,’ says Brian Jakins, Intelsat’s regional vice-president, Africa. 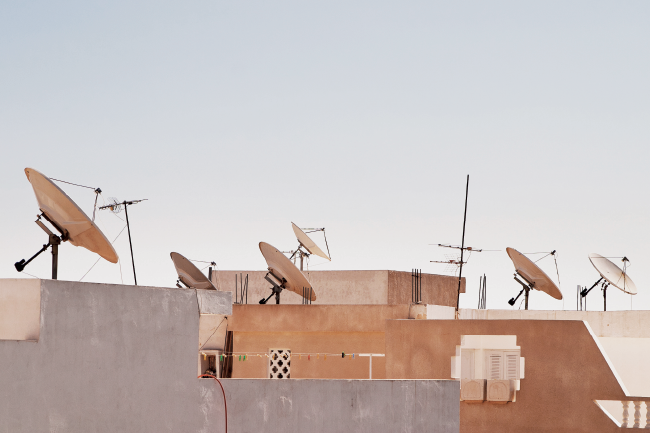 In September, Belgium-based Newtec, a company that designs, develops and manufactures technology and equipment for satellite communications, signed a contract with Arab Satellite Communications (Arabsat). According to Newtec, the contract will signal the launch of new high-throughput satellite (HTS) services in Africa and the Middle East. It will focus on ‘introducing enterprise and VNO [virtual network operator] services, IP trunking and mobile backhaul for 3G and 4G services in the Middle East and Africa regions’ and, once in operation, the new services will use Arabsat satellite capacity, according to the company. Meanwhile, UAE-based satellite operator Yahsat has launched its broadband service YahClick in Ghana. This is in partnership with Yahsat’s regional broadcast and internet service providers Comsys and Teledata. According to the company, the West African country is ‘a very important market’. It is expected that the service will ‘help overcome the substantial economic losses in recent years due to frequent internet breakdowns in Africa’. YahClick will use the Ka-band powered by the company’s HTS spot beam technology. ‘The driving force behind the launch of YahClick in Ghana is our desire to serve the country’s specific connectivity needs and deliver high-performance, customised satellite broadband solutions to its businesses and communities,’ says Farhad Khan, chief commercial officer of Yahsat. YahClick will be aimed at sectors such as finance and resources, as well as government healthcare and education initiatives. No matter whether they are big or small, a rise in the number of satellites in orbit over Africa means more opportunities for not only scientific research but also connectivity for ordinary people.